Welcome to the website for the Salisbury Café Scientifique! Here you will find information about the Salisbury based branch of this international organisation including details of our past and future talks and how to attend one of our events. Café Scientifique is a place where, for the price of a cup of coffee or a glass of wine, anyone can come to explore the latest ideas in science and technology. Meetings have taken place in cafes, bars, restaurants and even theatres, but always outside a traditional academic context. Café Scientifique is a forum for debating science issues, not a shop window for science. We are committed to promoting public engagement with science and to making science accountable. Everyone is welcome to come and express their views or just enjoy a drink and listen. No scientific knowledge is assumed and everyone can participate. For news and updates, why not sign up to our mailing list? See the calendar for dates and times of upcoming events, both those organised by us and other organisations. Do I need to book tickets? Visit our archive of posters for past and upcoming speakers to see the range of topics covered. 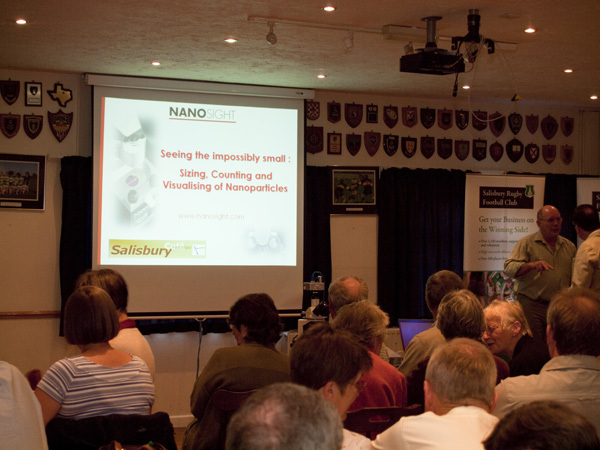 To keep up to date with Salisbury Cafe Scientifique, sign up to our Mailing List. Events take place on the first Tuesday of the month, each month except August. Doors open at 7:00pm when the Bar and Cafe will be open for light refreshments before the event which starts at 7:30pm. See the Calendar for details of upcoming events. Salisbury Rugby Club, as shown on the map below; see the venue page for directions.